A Family-focused community event held at the Avanti’s Dome in Pekin, IL. April 13, 2019. • Character Look-A-Likes & Much more! 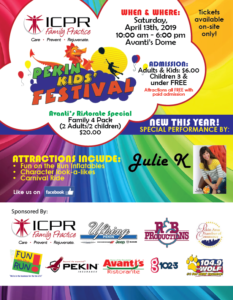 Tickets are $6 Avanti’s Family Four Pack $20 (2 Adults / 2 Children) Children 3 and under are FREE.